Our concerns for the future supply of our basketweaving rushes (Cyperus spp.) are at the heart of our teaching at Camp Coorong for Race Relations Cultural Education. The rushes are continually being depleted by stock grazing, mowing, weed sprays and neglect of our waterways and Wetlands of International Significance. The Murray River, Lakes and Coorong were suffering and drying from the 8-year drought and from 200 years of mismanagement of our waterways. We had turned to using recycled fibres such as string, garden twine and wire. In response to this need for materials from the land, we created an artistic working group, Ngarrindjeri Eco-Art Coop (NEAC), to embrace the principle of using local materials that would not harm the Earth. Recycling discarded items into art gives new meaning and value to materials that could become an environmental hazard. Fig. 1. 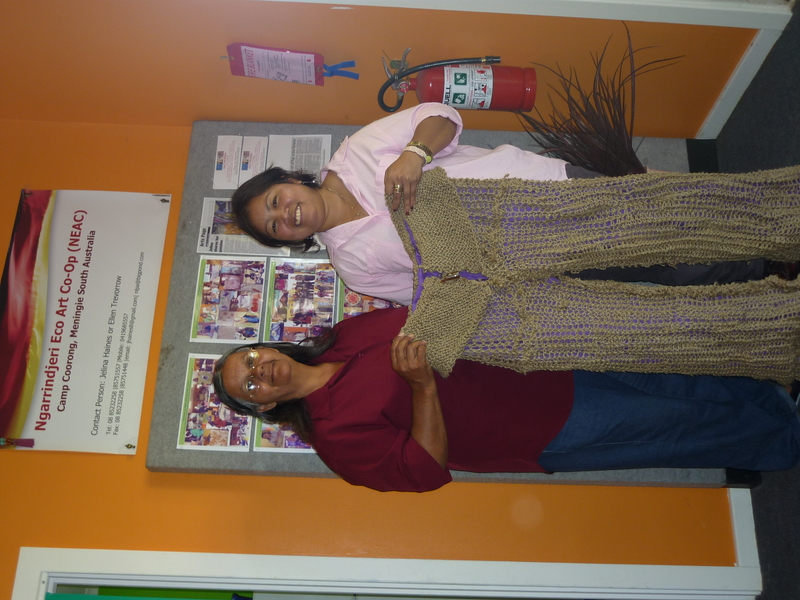 Ellen Trevorrow and NEAC teacher, Jelina Haines, with woven trousers from recycled string. In the last two years several cultural, spiritual ceremonies were held to bring back the water to the River and the Coorong estuary, to help our totems (plant and animal ngatjis). In 2009, we were graced by a visit with Grandmother Agnes Pilgrim, who came to Camp Coorong to give a water blessing to bring back the healing waters to the land. Many community members danced and sang to the waters and apologised to the ngatjis for their neglect. In 2010, the first Ringbalin ceremony was conducted at significant places along the length of the Murray Basin and Rivers, to bring back the health of the river system. The Talkindjeri Dancers, led by the Ngarrindjeri elder, Major Sumner, travelled for two weeks along the river, stopping at towns along the way to meet with people who joined in the dancing and ceremony on the River. At the end of the river, as Talkindjeri danced on Brown’s Beach at Lake Albert near Meningie, the rains began and the drought was broken. The rushes returned and the Murray River soon flowed again to the Southern Ocean. Fig. 2. 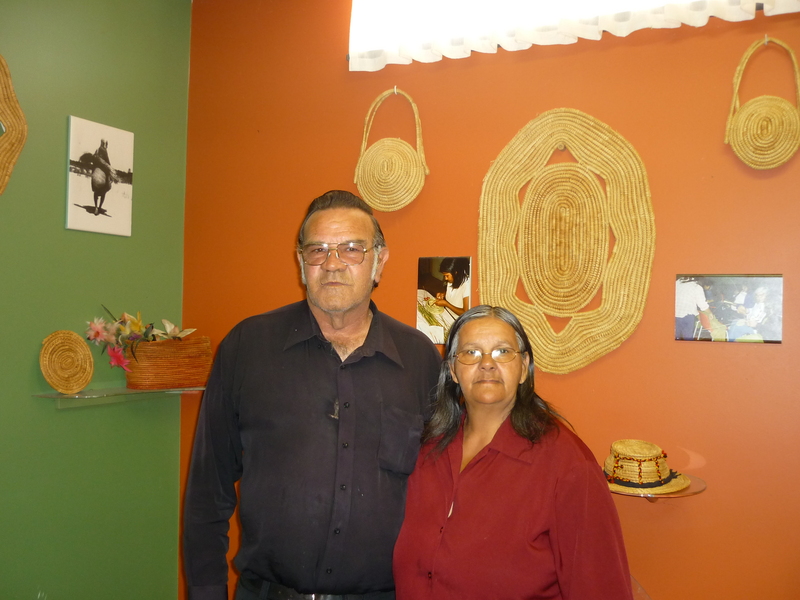 Tom and Ellen Trevorrow, Ngarrindjeri leaders at Camp Coorong for Race Relations and Cultural Education. Although the basketweaving plants are growing once again, we are still conscious of the care and use of the weaving rushes. We always balance our need to collect rushes against the supply and reproduction of healthy plants and healthy country. Our ngatjis, the local plants and animals, tell us how we are going, and what we should do to keep the Coorong alive. Now the Working on Country crews are growing the rushes and planting them out in country, hoping to sustain the future of basketweaving and culture. Ngarrindjeri people have been relentless about asking the Murray Darling Basin Commission to ensure cultural flows are considered as part of critical human needs. We also ask that cultural flows reach all parts of the River to sustain our ngatjis, the native plants and the fish stocks. We believe that when our ngatjis die, we die. Contact: Ellen and Tom Trevorrow, Camp Coorong, Box 126, Meningie, SA 5264, Australia. Tel: +61-8-8575-1557; Fax: +61-8-8575-1448; and Joan Gibbs, University of SA, Mawson Lakes, SA 5095, Australia. Tel: +61-8-8302-5164. This entry was posted in Cultural & socio-economic issues & solutions, Indigenous land & sea management, South Australia. Bookmark the permalink.